60 sensitive fragrance free toilet wipes. 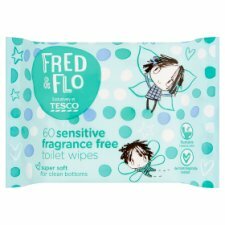 Fred & Flo sensitive fragrance free toilet wipes have been specially developed to help your little one stay clean and fresh during toilet training. Formulated to be super soft and gentle on little bottoms and are perfectly sized for small hands to help them build confidence during toilet training. Dermatologically tested and pH balanced, which helps maintain a suitable pH for skin. Encourage your child to peel back the label and remove a wipe. To use, wipe the bottom front to back. If your toddler uses more than one wipe, always flush the wipes away one at a time. Reseal label after use to keep wipes moist. As wipes are flushable, please remove wipe as gently as possible to avoid tearing. INGREDIENTS: Aqua, Phenoxyethanol, Glycerin, Sodium Benzoate, Cetearyl Isononanoate, Potassium Sorbate, Ceteareth-20, Cetearyl Alcohol, Citric Acid, Coco-Glucoside, Glyceryl Stearate, Ceteareth-12, Cetyl Palmitate, Benzoic Acid, Aloe Barbadensis Leaf Juice, Tocopheryl Acetate, Chamomilla Recutita Flower Extract.